It is always a good winters day when a Jack Snipe is encountered. Usually you come across them in ones and twos and my local record comes from 2010 when a severe bout of cold weather brought five together feeding in an unfrozen iron-water ditch. This winter, so far, has been relatively mild and not the sort of winter when records are broken but earlier this month all that was about to change.For years I had walked past an insignificant local peat bog and occasionally flushed a Common Snipe. 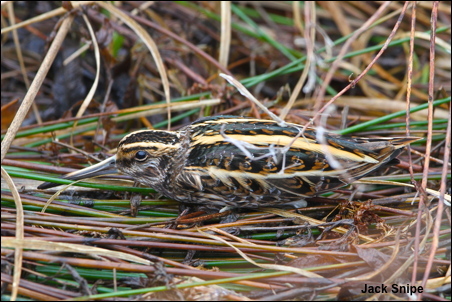 After a period of heavy rain six Common Snipe were feeding in this bog together with six Jack Snipe. If that was not good enough at dawn on the 4th January, following three degrees of frost, I checked the bog again. To my utter amazement after eighteen Common Snipe flew off eleven Jack Snipe were found feeding, including four together. This must be one of the greatest concentrations of Jack Snipe ever recorded in Greater Manchester. On the 16th Jan despite thirty three Common Snipe being present there were no Jack Snipe – all had moved on to some other secret locality.